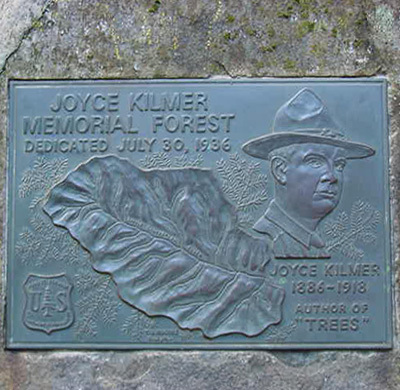 Source: Joyce Kilmer Memorial Forest, Robbinsville. Photo courtesy of Steve Nix, About.com. The forest is one of the largest preserved tracks of original growth in the Appalachians. It includes a two-mile figure eight recreation trail through Poplar Cove, containing some of the largest trees; it also passes by a memorial plaque, which is embedded in a large boulder. In 1936 the Forest Service bought 13,055 acres of land that had been spared from logging due to its uniqueness and age. Veterans of Foreign Wars requested that the government set aside a living memorial to the poet and soldier Joyce Kilmer. In 1975, Congress dedicated this land as the Joyce Kilmer-Slickrock Wilderness. Alfred Joyce Kilmer was born in 1886 in New Jersey. He attended Rutgers and Columbia and wrote literature and criticism for the New York Times Sunday Magazine, including his most famous poem “Trees” in 1913. He enlisted in the 7th Regiment of New York National Guard in 1917 and was deployed later that year. He was killed on July 30, 1918 and posthumously awarded the Croix de Guerre by France. Located within the far western corner of the state, about 15 miles from Robbinsville, the 3800-acre Joyce Kilmer Memorial Forest is an original Appalachian forest growth area of the Nantahala National Forest. It is located within the Joyce Kilmer-Slickrock Wilderness, an area around Little Santeelah and Slickrock Creeks spanning North Carolina and Tennessee. The wilderness totals 17,394 acres: 13,562 in North Carolina and 3,832 in Tennessee. The forest is one of the best-preserved examples of an old-growth cove hardwood forest, with rich soil, good moisture, and diverse flora. Some trees are over 20 feet in circumference, more than 100 feet tall, and are estimated to be over 400 years old.